. . .can I eat two big wedges of that pie? Please? 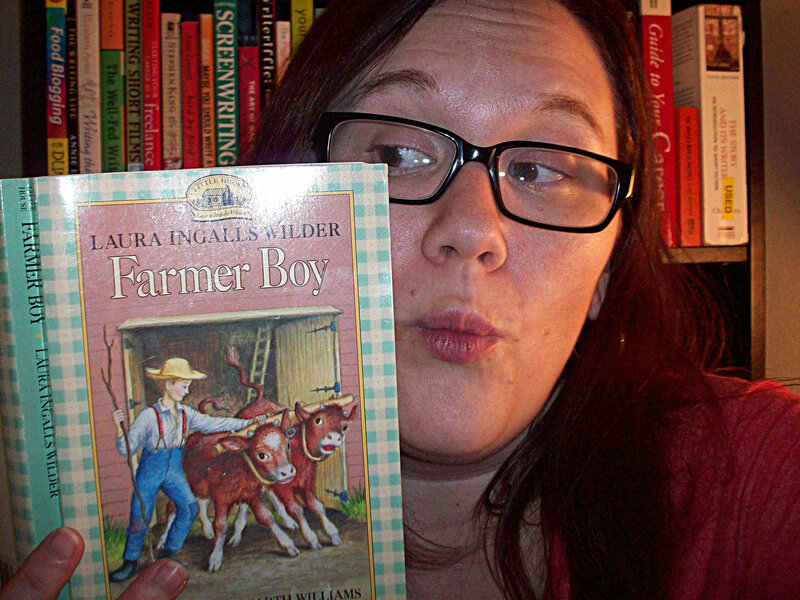 Farmer Boy and These Happy Golden Years are two of my favorite Little House books, and the recipe I tried was from Farmer Boy. In the chapter called “Summer-Time,” Wilder describes how her future husband, Almanzo Wilder, and his siblings spend summer days picking berries to bring home for their mom to make into delicious treats: jellies, jams, preserves. . .and blueberry ‘pudding.’ This isn’t pudding in the traditional sense, but more of a cobbler. There’s also a sauce that goes with this. . .but we’ll get to that later. Since I don’t live in the pioneer times and I do have a stove, I altered this recipe a bit. The original calls to cook this in a can in boiling water. I opted for the stove. 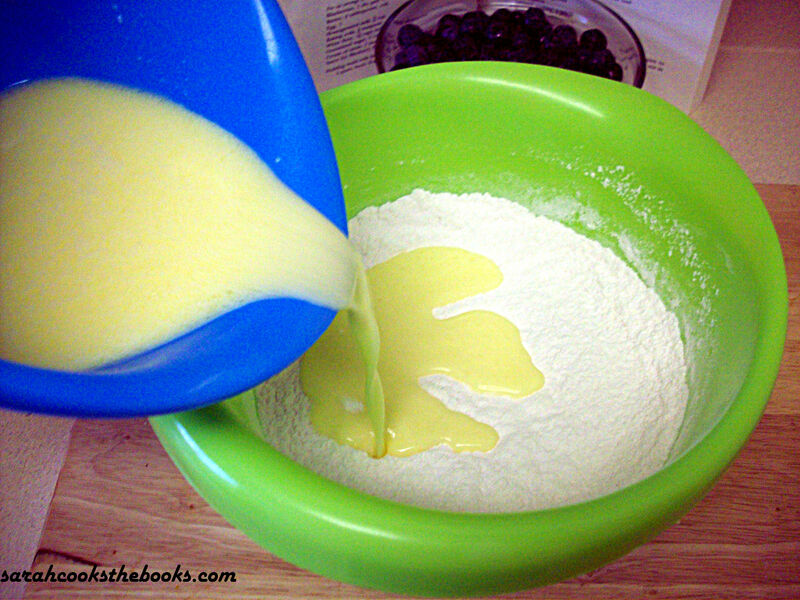 Use two of the tablespoons of butter to grease the dish you’re using. I used a 3-qt. dish. 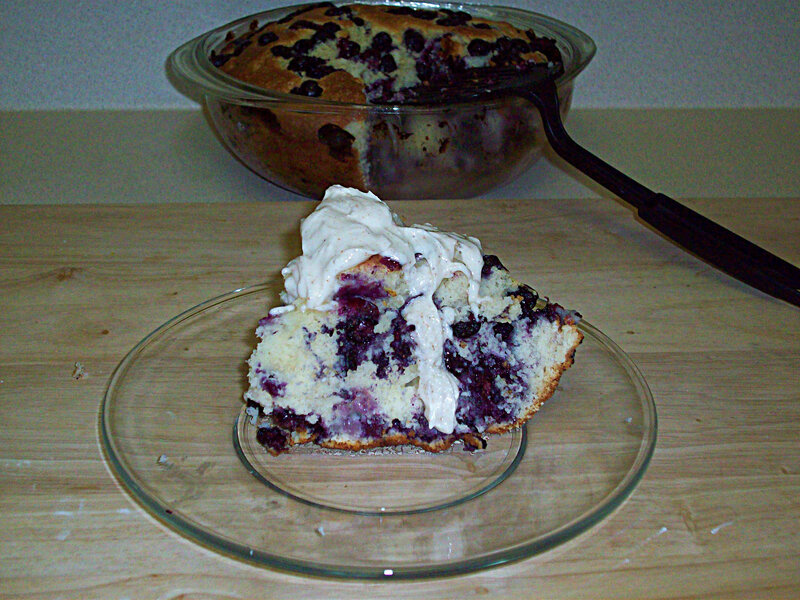 You can also use a 9×13″ pan, but you’ll have to change the baking time. 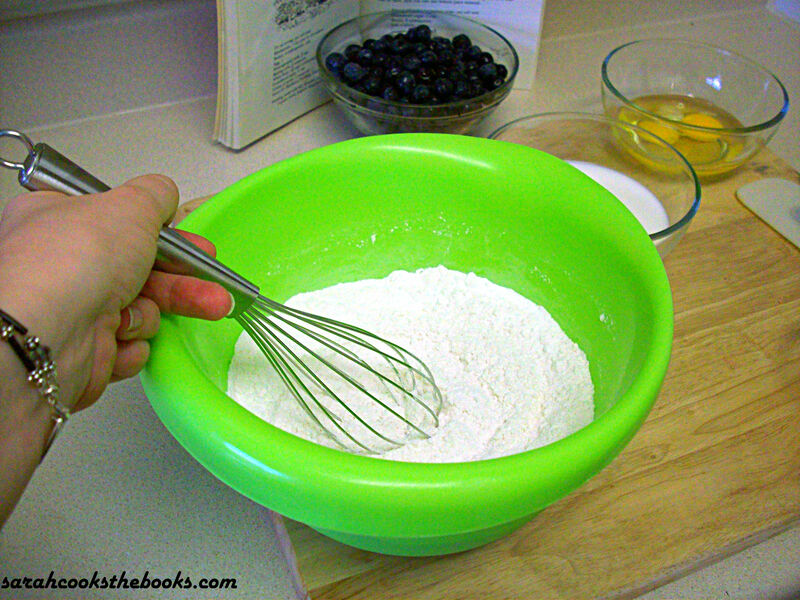 In a large mixing bowl, whisk together the sugar, baking powder, salt, and flour. 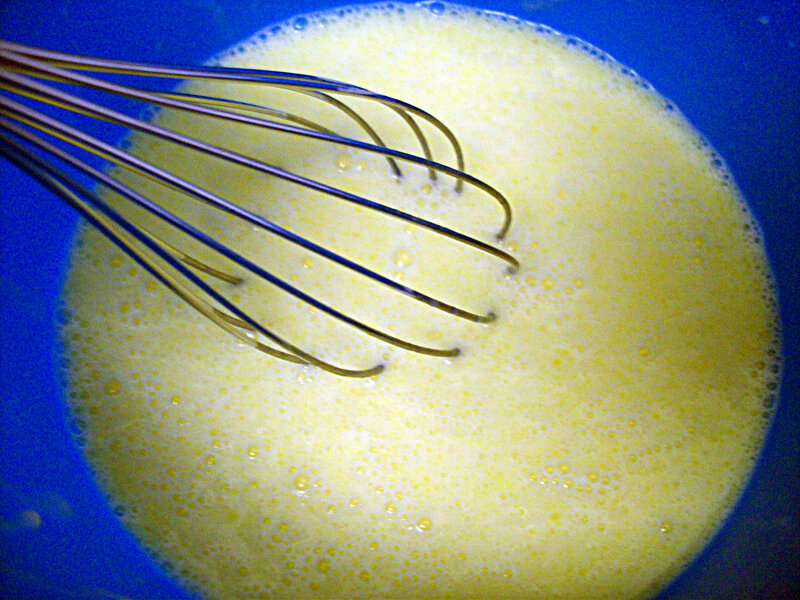 In another bowl, whisk the milk, remaining butter, and eggs. 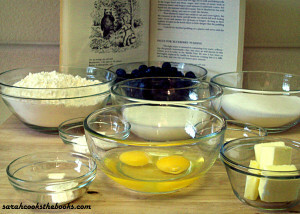 Mix the wet and dry ingredients together until well combined. 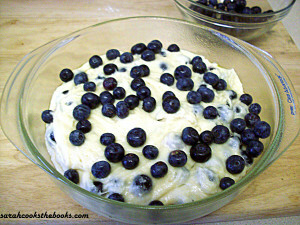 Carefully mix in most of the blueberries, saving some to sprinkle on the top. Pour the batter into the baking dish and sprinkle the remaining blueberries on top. 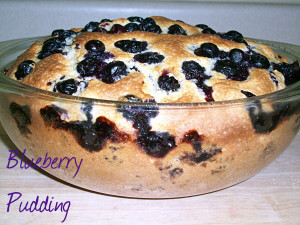 Bake pudding for 1 hour. Now, here’s a full disclosure. I didn’t make the rose water sauce the way I’m going to tell you to make it. I’m going to give you the recipe from the book. Mine was pretty bad and tasted like rubbing alcohol. So what you see in the picture isn’t what yours is going to look like. Hopefully. Simmer the sugar with 2 cups of water until it begins to thicken into syrup, about 10 minutes. Remove from heat and stir in remaining ingredients. Serve warm over the pudding. 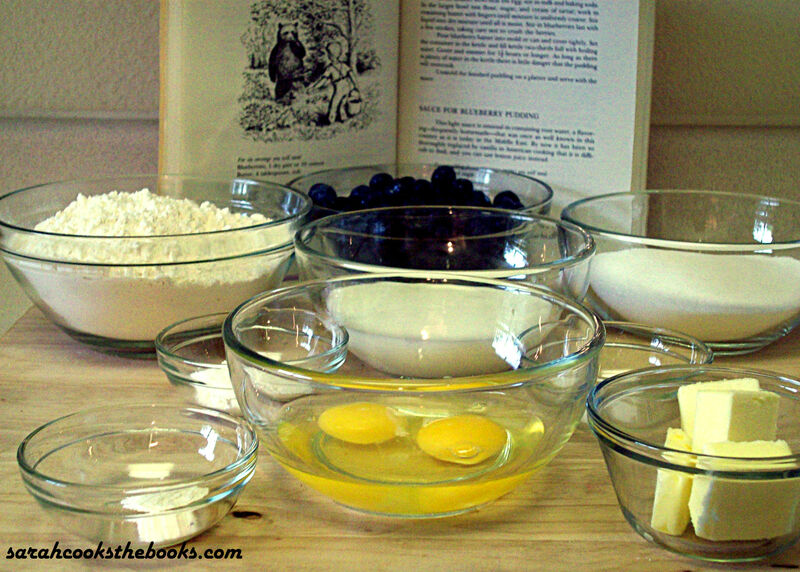 Sarah is in the process of making recipes from every book in her extensive, ridiculous cookbook collection and is blogging her progress at Sarah Cooks the Books. She also tweets random thoughts and ruminations as GarconMeansBoy on Twitter. That looks so good! 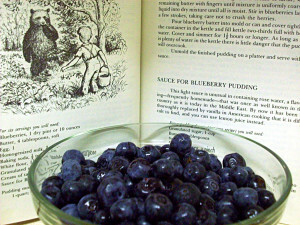 Makes me want to try the recipe AND go re-read all the Little House books. Those were some of my childhood favorites too. Since I loved both the Little House books and this cookbook for so long, both were common check-outs from the library! I’d read the books, then try to find the recipes in the cookbook when I came across a passage about food. Previous post: I Have My Degree, What’s Next?